An upcoming biopic about the father of Serena and Venus Williams has faced criticism amid reports that Will Smith will play the lead role. Richard Williams, 77, coached his daughters to become two of the world's greatest tennis players, despite having no previous experience of the game. 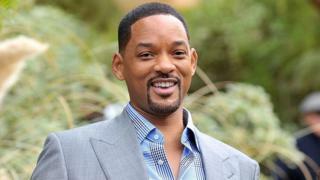 But Smith's reported casting in the film has angered critics, who say he is too light-skinned for the part. The actor has not yet commented on the reported casting or the criticism. Colourism is a form of discrimination against dark-skinned people in favour of those with lighter skin from the same race. It can lead to a lack of representation in film, TV and fashion, particularly in Hollywood and Bollywood, as well as discrimination at work or on dating sites, and even to serious health problems from skin bleaching creams. Media captionColourism: "There's not just one way of being beautiful"
Smith's casting in the film has not been confirmed. However, after a report from Deadline News claimed that the 50-year-old actor was "poised to play" Mr Williams, many people expressed their anger on social media. The criticism stems from the fact that Smith is significantly lighter than Mr Williams. US-based sports writer Clarence Hill Jr tweeted that "colourism matters", and said that Smith wasn't the right choice. This sentiment was echoed by many others, who felt that giving the part to a dark-skinned actor would "make more sense". People also suggested other actors who could take on the role - including Idris Elba, and Oscar-winner Mahershala Ali. "Colourism is constantly subconsciously fed to us and we just eat it up," one user added. However, one person did point out that Ali and Elba might be too in-demand to be able to take on another film. And another said the casting made sense as, although he has lighter skin, Smith is still a "prominent black actor" playing a "prominent black figure in the sports industry". This isn't the first time a Hollywood film has become embroiled in a colourism row. The casting of Zoe Saldana, a light-skinned actor of Puerto Rican and Dominican descent, as the African-American civil rights activist and musician Nina Simone in 2016 sparked similar criticism.